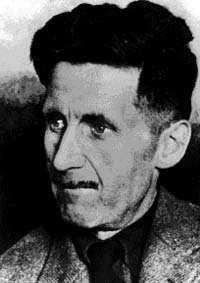 George Orwell is the writer whom I most admire. He is not the writer with the greatest insight into things, he is not the most brilliant literary stylist, and he is not the writer who gives me the greatest pleasure. He is the writer I would have most liked to resemble—in his honesty, in his fearlessness, in his clear writing (which is partly a product of his honesty and fearlessness) and in his affirmation of common life and ordinary people. He is remembered for Animal Farm and 1984, but his essays and journalism are just as interesting. He was a radical, but not the kind of radical who, like George Bernard Shaw, wanted to re-engineer human life into something unrecognizable, while leaving existing concentrations of wealth and power undisturbed. Here is a passage from The Road to Wigan Pier, which is about the lives of unemployed coal miners in the north of England in the 1930s. He wrote about what he saw from the window of his train as he returned to his home in the south. A graph showing what went wrong with the U.S. 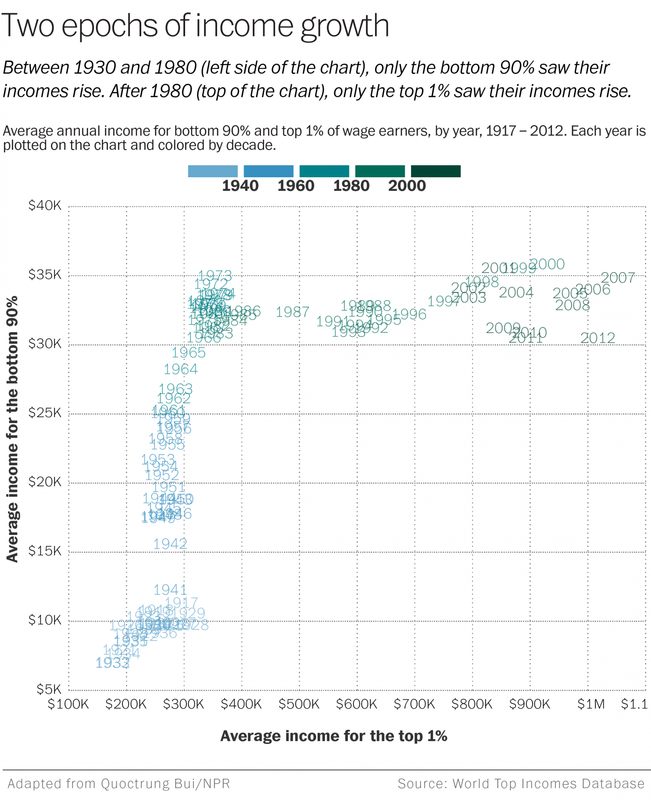 This chart shows the average annual income, year by year, of the bottom 90 percent of income earners (top to bottom scale) and upper 1 percent of income earners (left to right scale). Unless you have a good reason for believing that American working people became less productive after 1973 or so, and the economic elite suddenly became more valuable, there is something very wrong with the U.S. economy. We’re conditioned to believe that the candidate who has the early assent of a handful of executives on Wall Street and in Hollywood and Silicon Valley is the “serious” politician, while the one who is merely the favorite of large numbers of human beings is an irritating novelty act whose only possible goal could be to cut into the numbers of the real players. Sports journalism treats games as if they’re matters of life and death. Political journalism treats matters of life and death as if they’re all part of a game. Many of us Americans distrust the Iranians because we think of them as apocalyptic religious fanatics who can’t be trusted to behave rationally. We ought to look at the apocalyptic religious fanatics in our own midst—and in Israel. These are the evangelical Christian Zionists such as John Hagee and Pat Robertson who say that the United States should give unconditional support to Israel because Biblical prophecies say the foundation of Israel is part of God’s plan. 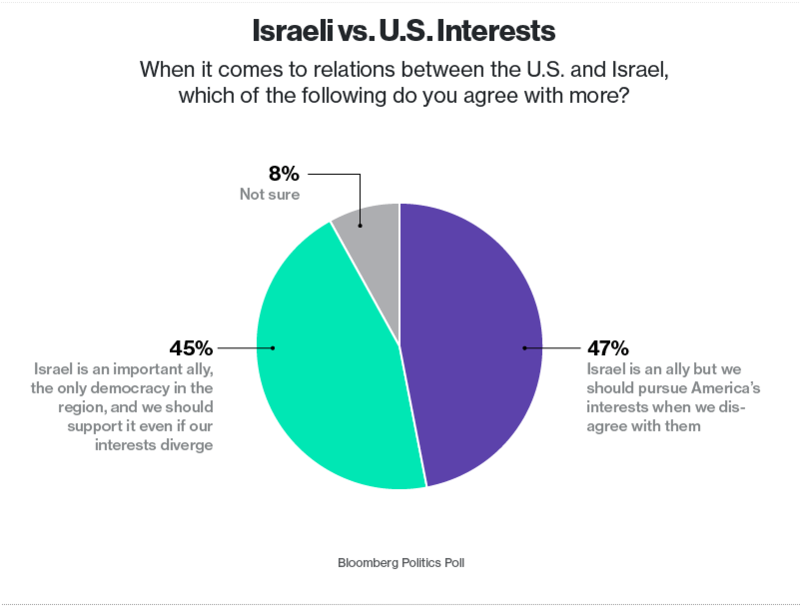 A recent Bloomberg poll indicated that 46 percent of Americans—and 58 percent of American born-again Christians—believe that the United States should support Israel even when it is not in the American national interest. Now there is a sense in which I believe this myself. I think it was right for the U.S. government in the 1970s to send aid to Israel when Israel was in danger of being wiped out, even though the United States lost some geopolitical advantage by doing so. This is a different thing from saying today that the United States should attack Iran for Israel’s benefit. It is also a different thing from Mitt Romney saying in 2012 that Americans should not allow any “daylight” between American foreign policy and Israel’s. Or Ted Cruz a few months ago making support for Israel a litmus test for persecuted Middle Eastern Christians. These Plasser & Theurer machines are awesome. It is even more awesome to think that the U.S. transcontinental railroads were all laid by laborers with hand tools, without such machines as these. We owe a lot to those old-time railroad laborers, like John Henry in the song. But we also owe a lot to the inventors and industrialists who made it possible to do the work without back-breaking labor. Notice, though, that there are workers all around the track-laying machine. The machines don’t run themselves. Human beings are not obsolete. Some time ago I came across a map showing that half the world’s population lived in the densely-populated parts of China and India and a couple of the adjoining countries. 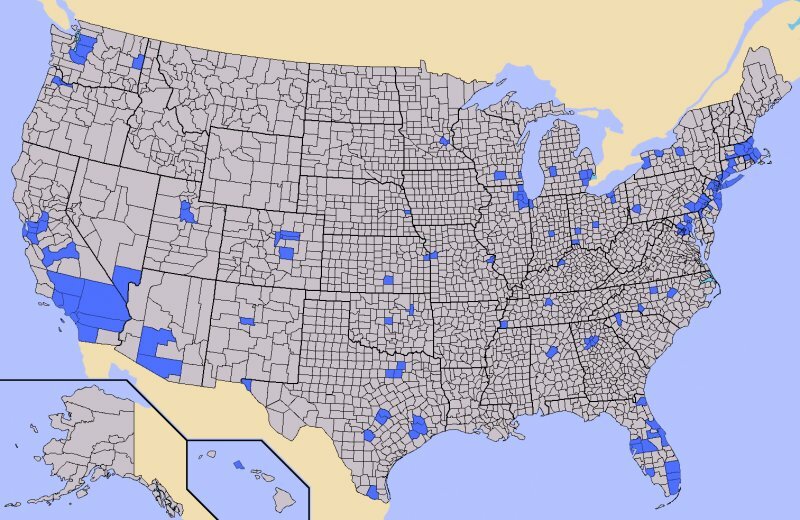 The other day I came across an article about how half the U.S. population lives in just 146 of the nation’s more than 3,000 counties and county-equivalents. The 146 counties are shown on the map below. My home county, Monroe County, New York, is one of the 146. Compiling a list of America’s counties is more complicated than I would have thought. The United States has 3,007 counties, but not every American lives in a county. Louisiana is divided into 64 parishes, which are the equivalent of counties. Alaska, when it was admitted as a state, had no county governments at all. Instead Alaskans have the right to form governmental units called boroughs. There are 19 boroughs in Alaska, but half the area of the state is an unorganized borough, covering 11 census areas. There are 41 independent American cities, not part of any county, in Maryland, Missouri, Nevada and Virginia. And there also is the District of Columbia. Counting all these the United States has 3,143 counties and county-equivalents. 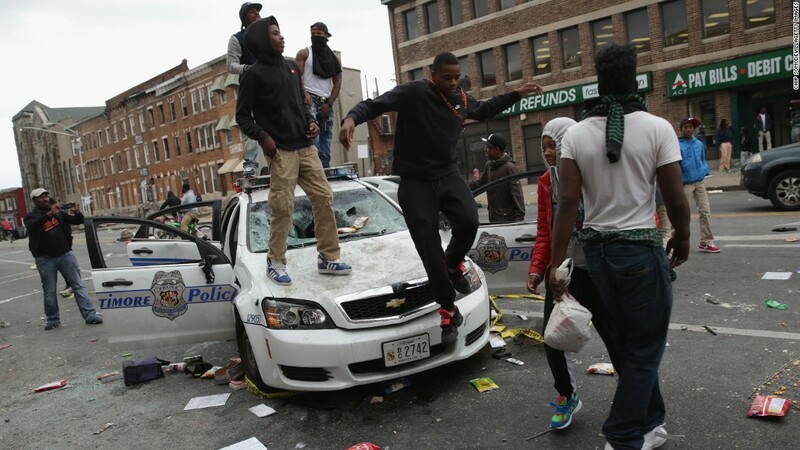 There are two county-equivalents on the list of 146—Baltimore City and Washington, D.C. The Obama administration considers the real alternatives to drone strikes to be the unpalatable options of grueling ground wars or passive acceptance of terrorism. Then it congratulates itself for picking the wise, ethical and responsible choice of killing people without knowing who they are. One of the things I’ve come to realize in recent years is that institutions exist that constitute a kind of world government. I always thought that for a world government to exist, it would have to have its own army. But the International Monetary Fund, the World Bank and the investor-state dispute settlement judges in international trade agreements don’t need armies to enforce their—unless you consider the U.S. Central Intelligence Agency to be their army. 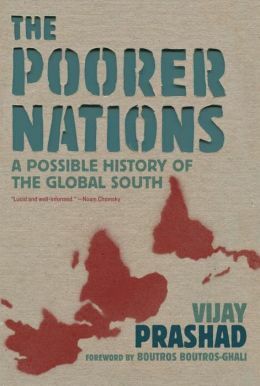 I just finished reading THE POORER NATIONS: A Possible History of the Global South (2012) by Vijay Prashad, which is about how international institutions came into being to fight nationalistic governments in Africa, Asia and Latin America—the Third World. These international institutions are greatly from the world government envisioned by the idealists who created the United Nations. I’m worried about how the Trans Pacific Partnership agreement and other proposed trade agreements would create rules to protect international corporations and investors against national laws to protect labor, public health and the environment. But for Third World nations, as Prashad showed, this is nothing new. The Andromeda galaxy, aka M-31, is the one closest to our Milky Way galaxy. It has 100 million stars. The Hubble telescope gave a better image of that galaxy than every before. Each little dot in the video is a star equivalent to our sun. Don’t forget that most men with nothing would rather protect the possibility of becoming rich than face the reality of being poor. I’ve often heard this said. Is it really true? It’s common in the United States to hope for a better life, including a higher income, than your parents had, and to hope that your children will have a better life, including a higher income, than you had. It’s common in the United States to hope for success in your chosen endeavor, which, if you’re an entrepreneur, involves getting rich, but not merely getting rich. All or almost all entrepreneurs I’ve ever met hoped to accomplish something worthwhile and to be rewarded for it, which is different from the desire to acquire money by any means necessary. I’ve also met people motivated by mere greed, but none of them that I know of ever accomplished anything worthy of respect. Sadly, it seems to me that there are many such people in positions of power. Our American culture emphasizes the responsibility of every person to earn their keep and pay their own way. Those of us who’ve struggled hard to gain just a little are fearful of having that little taken away for the benefit of those who haven’t struggled. Sometimes that’s a realistic fear, sometimes not, but that’s a topic for another post. Hat tip to Jack C.
A writer named Eric Weiner visited the small Himalayan nation of Bhutan, and was suddenly overcome by shortness of breath, dizziness and numbness in the hands and feet. Fearing a heart attack or worse, he visited a physician name Dr. Karma Ura, who told him he suffered a panic attack. Corporations are immortal, trans-human artificial life-forms and humans are their gut flora. Gut flora and host organisms are often aligned in their interests. Ultimately, your gut flora’s strategies are not yours. The great photographer Inta Ruka has been documenting ordinary life in her native Latvia for decades—since before the tiny Baltic nation gained independence from the Soviet Union in 1991. The video above is a trailer for a documentary film about her life and work by the Swedish filmmaker Maud Nycander. Click on The Photographer from Riga to see the entire film. I strongly recommend it to anyone who has the least interest in photography or in a profile of a remarkable person. (Hat tip to Jack Clontz). The first two parts of the series show the working out of the ideas of three brilliant economists. Friedrich A. Hayek believed that governmental power is dangerous and counterproductive. It is better, he thought, to allow the economy to be regulated by an automatic system, the free market. John Nash of the RAND Corporation saw human beings as selfish and suspicious, but, for that very reason, predictable. He worked out the implications of “prisoner’s dilemma” situations, in which rational people are unable to cooperate for their mutual benefit because they cannot trust each other. The USA and USSR could not give up atomic weapons because neither could trust the other not to cheat. Instead the road to peace supposedly was for each to be armed to the teeth and ready at retaliate as soon as they were attacked. Because each could predict the other’s behavior, the situation supposedly was stable. James Buchanan, who won the Nobel Memorial Prize in economics, was the creator of “public choice” theory. He asserted that politicians and administrators are selfish beings who worked to their own advantage and not the public whom they supposedly served. Idealistic politicians and officials are the most dangerous, in this view, because they could not be controlled. Curtis documented how these ideas played out under Britain’s Prime Minister Margaret Thatcher and her successors. Many governmental functions were sub-contracted to private companies. Since government employees, according to public choice theory, could not be trusted to exercise their own judgment, they were given incentives to meet measurable targets. The idea was that this is liberating because people are not subjected to the arbitrary personal judgments of people over them, but to objective and neutral measurements. This kind of thinking is also playing out today in U.S. corporate and government administration. The result is a micro-management that diminishes individual freedom. And it doesn’t work. The incentive is to figure out ways of meeting the target which is a different thing from doing your job well. Curtis asserted that psychological studies show that the only people who behave according to the Nash-Buchanan theory are economists and psychopaths. That is an exaggeration. There is a measure of truth in what Nash, Buchanan and also Hayek say. The problem is that human beings are diverse and complex, neither altruists nor selfish calculating machines, and no one-dimensional theory can sum them up. Public choice theory is the application of economic theory to political science. It is about how government bureaucracies, which are created to serve a public purpose, change over time so that they serve the interests of the bureaucrats rather than the public. This is something that in fact does happen, and it is a big problem. But it is not unique to government. It applies to armies, college faculties, priesthoods, labor unions, corporate management and any other kind of big organization, public or private. It is possible to pass laws and regulations against corruption, but these laws and regulations will be ineffective unless most people have a moral compass that is backed up by public opinion. A market economy is a good mechanism but it does not provide a moral foundation for society. Future executives are taught in Economics 101 that they have no responsibility to society at large but only to their stockholders and that the impersonal workings of the free market will make everything come out all right. But if the free market makes everything come out all right, why should they even bother about the stockholders? Why should they not do what’s in their own self-interest regardless of the stockholders? Hardly any American politician talks about growing economic inequality in the USA. Instead they talk about equality of opportunity—the equal chance to work your way up into a higher economic bracket than the one you were born in. I agree with this up to a point. Somebody who is lazy and useless does not deserve to be rewarded equally with someone who is hard-working and productive. The problem is that it is much easier to work your way up when the majority of Americans are improving their economic condition. It is very hard to work your way up when the majority of Americans are falling back. Swimming with the current is something everybody should be able to do. Swimming against the current is a challenge that not everybody can meet. I am all for giving members of the underclass the means and the incentive to work their way up into the middle class. But in the USA at the present moment, there is less and less of a middle class for them to move up into. President Obama and other Western leaders gravely insult the Russian  people, as well as show base ingratitude, by snubbing V-E Day celebrations in Moscow on May 9. The Red Army suffered more casualties in World War Two than the USA, UK, Commonwealth, France and all the other Western allies put together. 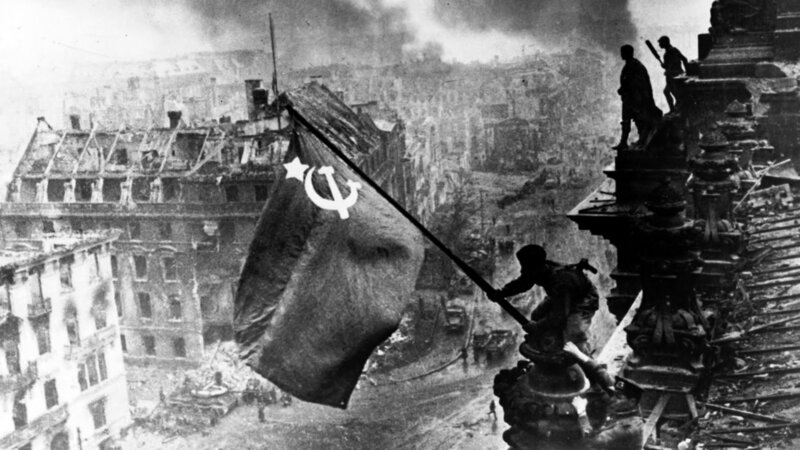 More than 80 percent of the Germans killed in World War Two died fighting the Red Army. If you remember the opening scenes in the movie “Saving Private Ryan,” reflect that the Normandy landings probably would have failed if the bulk of the German army had not been tied down on the Eastern front. 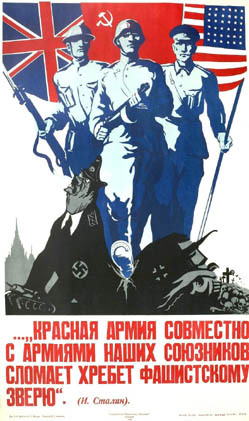 Then reflect that (although this is not certain) the Red Army might well have made it to Berlin even if the Normandy landings had failed. I am not an admirer of President Putin’s authoritarian government. Bad things happen to his political opponents although, it must be admitted, that is also true of opponents of the U.S.-backed regime in Ukraine. 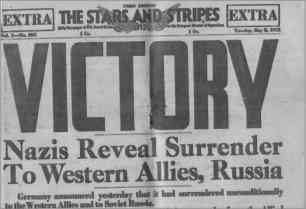 But boycotting the celebration of the 70th anniversary of V-E Day is more than just a personal rebuke to Putin. It is in a different category from a boycott of Olympic games or some other contemporary event. It is not just an insult to the valor and sacrifice of the Russian people. Human beings resent insults to their honor more than they resent material injuries. I fear Russians will remember this insult for years to come. The significance of “fast track” goes far beyond clearing the way for quick approval of the Trans Pacific Partnership agreement. There are other TPP-like trade agreements now under negotiation, such as the Transatlantic Trade and Investment Partnership and the Trade In Services Agreement. The Trade Promotion Authority bill, otherwise known as “fast track,” would govern how such agreements are negotiated and voted on in the future. In theory this could work well. Negotiators would pursue objectives set by Congress, the leaders of Congress would be kept informed as negotiations progress and ratification of the agreement would be only a formality. But there is no mechanism in the current fast track bill by which Congress can call the negotiators to account or demand information. Fast track assumes good faith on the part of all concerned, and, based on the historic record, including the way the TPP has been negotiated, I think this would be a naive assumption. Hatch Bill Would Revive Controversial 2002 Fast Track Mechanism That Faces Broad Congressional, Public Opposition by the staff of Public Citizen’s Global Trade Watch division. The U.S. government should beware of being drawn into the conflict in Yemen. 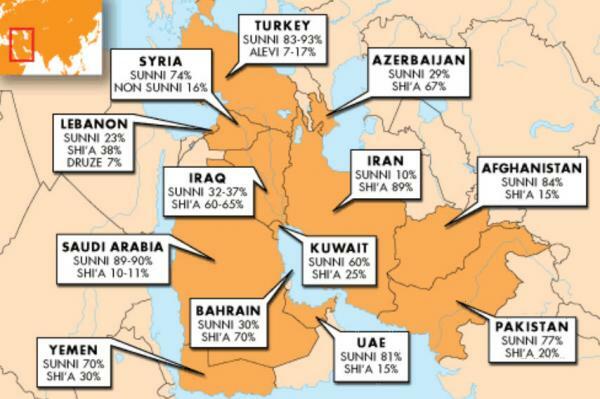 The fight among Shiite Houthi militia, Al Qaeda in the Arabian Peninsula and the government of Yemen are part of a wider Middle East conflict between Shiite and Sunni Muslims. Source: Zero Hedge. Click to enlage. That religious conflict is overlaid with a conflict between two alliances of Middle East powers—Iran, Syria, Hezbollah, Hamas and the Shiite militias on the one hand, Saudi Arabia, the Gulf emirates, the Sunni militias in Iraq and Syria and Turkey, with Israel as a silent partner, on the other. Washington sides with Saudi Arabia and Israel. I have come to realize that sanctions against Iran were never about the imaginary danger of nuclear weapons, but to keep Iran weak. Now Iran has found an ally in Putin’s Russia. This is a highly dangerous situation. National governments are keeping the religious wars going by sending arms and money to the different religious factions. But religious wars are not controllable. Being drawn in to these wars serves no national interest of the United States, does not benefit the people of the region and puts the American people at risk of being drawn into a wider war. The USA has had a strange relationship with Iran during the past 35 years. While waging economic war against Iran, the U.S. government strengthened Iran’s position by defeating its main enemies, the Taliban regime in Afghanistan and the Saddam Hussein regime in Iraq. A defeat of ISIS would further strengthen Iran. By agreeing to end sanctions, the Obama administration appeared to accept Iran as a major power in the Middle East. Now Obama is sending warships to checkmate Iranian power. 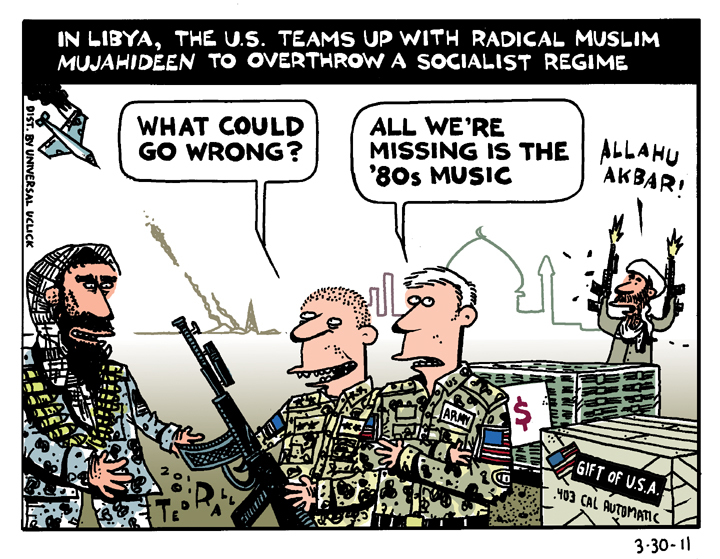 I’m by no means an expert on the religious and cultural geography of the Middle East, but I don’t see this ending well.